Pure Country: Pure Heart (film, 2017). A 2017 American direct-to-video country musical film with "PG" rating by Warner Bros. Home Entertainment and Warner Home Video. Directed by Damon Santostefano. Official Trailer. Pure Country: Pure Heart is a 2017 American direct-to-video country musical film directed by Damon Santostefano. 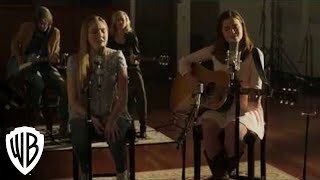 Pure Country: Pure Heart Trailer. Ada Spencer and her younger sister, Piper, are high schoolers living in a rural Tennessee farmhouse with their widowed mother Elizabeth and their grandmother, Meemaw. When a water pipe bursts, the girls find a Silver Star and other information about their father, whom their mother never talks about. Over the next few days, the girls repeatedly lie and say they are going to the farm of Ada's friend, Justine, but actually catch rides with Justine to go learn more about their father. At the nearby State Veteran's Home, they meet Iraq War veteran Henry Monroe, who tells them about serving in the Marines with their father in 2004, when their father saved his live by jumping on a grenade. They also meet C.J. Simms, a Korean War veteran and musician who is impressed by their singing voices. They learn that their father had been a country music singer, so they travel to Nashville to learn more about him. They meet Declan, who soon strikes up a relationship with Ada. Declan helps them meet Marq Dunn, the lady with whom their father had written and recorded his music. After hearing them sing, Marq invites them back to Nashville to record a song. The sisters get in trouble when Elizabeth finally learns that they have been lying about their whereabouts. Eventually Elizabeth and Meemaw reveal that their father had stopped his music, of his own accord, to be present for his wife and family. Elizabeth visits Marq, reconciling with her and leading to Ada and Piper singing one of their father's songs, on stage with Willie Nelson and Marq, at a fund raiser for veterans. The film Pure Country: Pure Heart was scheduled to be released by Warner Bros. Home Entertainment and Warner Home Video on August 1, 2017. The duration of the film is 84 minutes.